Galway - On Friday we can expect mainly cloudless weather. Severe Weather Ireland offers current weather data, local weather forecasts and more useful information about weather. With the help of our high-resolution weather radar and current severe weather warnings nasty surprises will belong to the past. Climate in Ireland is basically determined by the Atlantic Ocean and the Golf Stream. As a consequence Ireland's climate is defined as maritime. The ocean's ability to store huge amounts of heat are the main cause for Ireland's mild winters, compared to other regions on earth located at the same latitude like Russia or Canada. Maritime climate is characterized by slighty differences in temperature between night and day, as well as between different seasons. Dominant westerly currents continuously transport moist air towards Ireland, causing high humidity and lots of precipitation throughout the year. Mountain ranges distributed all over the country affect the distribution of precipitation. The windward side of hills and mountains experience larger precipitation amounts. For instance Valentia Island along the west coast receives almost twice the precipitation amount compared to Dublin on the east coast. 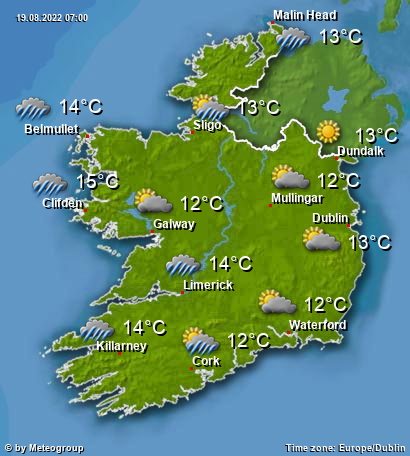 Warmest places in Ireland are located in the southwest with average temperatures of 10.5 degrees throughout the year. Coldest regions are located in the inner parts of the country with average temperatures of 8.8 degrees. Temperatures above 30 degrees or continuous frost in winter time are rare. Sunniest months in Ireland May and June with average sunshine duration of 5 to 7 hours a day. Strong depressions from the Atlantic with gale force winds may affect Ireland throughout the year, but are more frequent in winter.